thanks for all the new updates and photos!!! (1) Great pics! Love the toe shot and your Pelican makes a good "first Mate". how do you have internet all the way on in the middle of the ocean?? just curious if anyone else can answer this please come to my page.. The Hobbit is one of my favorite books. The rest of the series was harder to read for me but that one book is right up there. I suspect as you get just a little more south, you are going to have more wind than is comfortable, so enjoy the weather you have now. I have spent a little time in the south when I was active duty Navy, and it can get nasty down there. Take care and keep us up to date on your trip. Great pics Abby...THANKS. I see you fixed the funky lead on the head'sl. @Mr. Wilson: OF COURSE, we can agree to disagree. If often makes conversation much more interesting. I hate to admit that I kind of like when the wind is slow cause then you post pictures and new blog posts. You have been my twice daily work distraction for the past 40 days, so it's nice when there's something new to see. Good luck getting to that cold front. Glad to hear that you didn't get hit too hard in the storm. Clean laundry, a good read, and Mr Pelican (sorry I don't know his name)for good company, sounds like a few good days to relax and rest. Know you are anxious to get where you are going, but you're already there, for afterall it's the journey that counts. Stay safe, and happy sailing, kiddo. You are looking good! Also a skipper and navigator on a long journey. And a very good photographer. How fun it is to watch you go...it is so much like reading a live story...your story and like someone else said it is so much fun to see you come up on the reader! I can't believe it was all the way back on the 19th of Feb when you crossed the equator...now it's March and that is amazing! We are getting ready for softball season here in Ohio and there are still huge piles of snow in the parking lots! But they are shrinking...yeah! Stay alert, don't be complacent, and we will continue to pray for your safety each day. A very nice end to an excellent day - thanks much for that update and the happy photos. I am liking that Charlie all the more. We are having much colder weather here in the Daytona Beach, FL area. This is "Bike Week" and who so says there are 500,000 bikers here is not far off. Everyone is enjoying the elegant slaw wrestling contests and such. Jay Leno has his spot back which returns the Earth to its equilibrium. Get your dad to tell you about the little kid that was filling in for the heavy duty flight controller. Lots of us here at my house are thinking about you gal, all the time. Hi Abby I have read the Hobbit and Peter Jackson is at present filming a movie for it in New Zealand.They rebuilt the hobbit houses that they used in Lord of The Rings. Wonderful update. Nice to know all is well and dandy. Great photos! Love your Pelican! Hey Abby! We are a Christian, home-schooling family that just heard about your adventure, and we are so excited to follow along. We prayed for you tonight and will continue to do so. Our kids are 11, 9, 7 and 5. I'm excited to have them learn so much from watching you follow your dreams and hope that it will inspire them to follow their's as well. It is definitely inspiring to me, as their mom. Take care. My daughter said, "You can do it, Abby!" Have to laugh at the pictures. There we're all worried you're huddled in the tiny cabin holding on for dear life as you navigate around the world, little boat being tossed around like a cork in the ocean, and then this, a picture of what could be a day on a beach in the Caribbean, laying out in the sun relaxing while the washing is hanging out to dry. Even with proper big wooden clothes pegs! WAY back when I was in School.. and that was the lit. assignment.. we had to memorize all the names of the dwarfs... ready.... GO.. I found you through Glnroz. I'm amazed and had to become a follower. Abby, thanks for the update, kinda surprise to read your blog 2 days in a row, but it is most welcome. Take care and hope the wind be more friendlier soon so you can get back to Cabo on time to have a dinner with your family. From this old salty USN(Retired). Great pics. That’s a good shot of the laundry room and Charlie P. is sure styling. Sounds like you’re doing great keeping up on the nasty chores. That’s just a real necessity to save yourself big problems later. Well done, Abby. And I might as well tell you what happens to Mr. Bilbo Baggins. After he lost the dwarves and lost the wizard, he…………wait, I’m not going to give it away. You’re just going to have to finish reading the book, so make sure you don’t lose it again and enjoy the rest of the Hobbit. Have fun, Abby and always be safe. I would love to hear more from you about your feelings about being out at sea all alone. More importantly, what does it feel like to be in all of Gods Wonder?!! Hope the cables are strong, gives me the willies to think of you standing so close to the edge. Thanks for posting again so soon. It is so wonderful to live vicariously through you and your journey. I’m just a mom in Indiana and I can only imagine how proud your parents are of you. This is the time of your life; take every opportunity to reflect and focus on your task and adventure. A bit of advice though, in reading your blog, you write about losing things. From my experience of 45 years, being organized keeps your mind centered. When you let your environment become cluttered, it distracts from your focus. Your focus should be on staying safe and making the best use of all your time…even if it is just kicking back, reading about a new friend (your Hobbit and my Abby), and sailing into the sunset. wishing you a nice safety trip and God bless all the way. Do you ever go swimming or do you just stay in the boat? Whats the water temperature now? When you have finished reading the Hobbit someone will need to get you a copy of Lord of the Rings so you can see what happens in the end. Lovely shot of your toes! You go girl! 4 knots boat speed with 5 knots of wind? Must be nice. Those of us with old, slow boats are jealous. I hope you get some real wind and surfing seas. Sleep, clip on, and take care of your crew. everyone is always searching for a purpose greater than themselves. you help inspire people to search for that purpose. thank you. Thanks for the up-date and the pics, they’re great. Looks like you’re having a good time, the ‘Happy Feet’ look more like ‘Relaxed Feet’, enjoy it while you can, after a hard days work, you deserve it. @cowboychincs: Thanks for the grib link. Charley is a pretty cool looking guy in his straw and shades, and pretty big too. Aside from moral support does he help with the work? Glad to see things are going well for you, except for the wind, and that you seem to be in good spirits, keep ‘em up!!! Sometime back in the ‘70s I read “The Lord of The Rings” and really enjoyed it. Later on, I got the movies and almost wore them out watching them. That’s my kind of entertainment, plus the documentation of what the producers and directors went through to produce this excellent movie, I found to be very enjoyable. Let yourself go, and put yourself into the story, I hope you enjoy it. Take good care of yourself and Charlie, and most of all, enjoy, enjoy and then enjoy a little more. I’m very proud of your accomplishments and your dedication towards your goal, you’re a very strong minded girl. Thank you for the nice pix, Miss Abby! From your naked feet and the drying laundry, I get that you are the board's Cinderella, exploited by the Mafis Boss Pelican Charlie. He looks terrific with his straw hat and sunglasses. I hope he doesn't make you work too hard! It is good to see both of you enjoying your journey. Keep on that way! If you have some spare time, think of letting us know how you are sleeping; did you reach regular patterns? And what about your meals? How do you feel about the food you have? Great update... Great pics too. The Hobbit, as well as The Lord of the Rings (the trilogy), are some of my favorites. By the way... the butler did it... hehe... just kidding. Thanks again for the posts, and the pics. It's like you're bringing us along for the ride. Good luck and Keep on keepin' on !!! Really enjoyed hearing from you again so soon. Thanks heaps for the additional photos --loved all three of them. They each seem to speak many more than a thousand words! Priceless! And aren't you clever the way you promoted your sponsor with the 'Shoe City' tee on the 'clothesline'! :) Pretty clever! Abby, you are a terrific young lady! Capable and smart, too. And, you are endearing yourself to a huge following out here. We are all cheering you on to your goal. Looks like you and Cahrlie are having a little R&R. Thanks for sharing your pictures. The Hobbit is an amazing read as is the Trilogy. Loved the washing line..wait whilst I go get mine! That looks like a good drying day. Enjoy these moments and stay safe and sound. I thoroughly enjoyed the pictures you sent today. They brought a big smile to my face. God bless you in your great adventure around the world. I'm SO glad you enjoy the book, I said it was good and you seem to see it the same way. It is funny though to think of Abby the adventurer, reading about Bilbo the adventurer. All though a reluctant adventurer, as opposed to you. I'm currently in Bermuda, and will most likely go on towards St. Barts. in a few days. We had a bumpy and tiersome passage down here. We had an est. average windspeed of 30knots, sustained high of 40-45kn and never under 15kn, but all that is cruising winds for you I guess. We had 3 lowpressuresystems over 6 days, and I imagine that is about as close they are able to come. We altso had some minor damage, a ripped dodger and a broken stanchion. We even managed to get a few bucketloads of ocean through 2 of Maryams 6 doradevents. At the moment Maryam is hogtied to the dock waiting for a storm. We hope that we'll have nice cruise onwards, and I wish the same for you Abby. Thanks for warming my hart. Fair winds Captain and may Wild Eyes carry you gently home. How funny, we're reading the Hobbit here too (just started chap. 10 last night). Abby, we're fascinated by your trip and sense of challenge! My family used to sail in Europe, on Lake Geneva (which was a training ground for many good Swiss sailors), and now we're in So Cal. You're making us think we should get back into sailing! Enjoy your adventure, and thank you for your postings (we love reading them). Why don't you take the reef out if the wind is only 5 knots?? Abby, you're reading my favorite series of book of all time! Way to go, Hobbits Rule! Take care and keep the posts coming, you're got lots of devoted followers and folk cheering for your success. Abby . . . so good to see another update so soon! I am envious of all the sun and sea you have right now. It looks wonderful from up here in cold and grey NoCal. The Hobbit is one of my all time favorite books! Bilbo Baggins and his friends are perfect company for your voyage! yes i loved your pics!!! i love getting new updates from you...I was telling our Pastor about you and journey, sunday night...and we have this huge world map in our church..and he told me...to start putting markers up there to let everyone know...and we are going to start praying as a church for you!...I told him about your dad's prayer from mexico..he thought that was great! I wonder also..while you are out there...you aren't alone...you can always talk with the LORD...it to be in the mist of His Creation!!!.. And safe journey to the Horn...and the rest of your Adventure!!! The Hobbit is one of my very favorite books. I read it in high school, then a few years ago read it out loud to my three sons. This poem fits nicely with what you are doing! Great pictures! Gee that was alot of laundry and such monster clothes 'pins', whoa! Charlie is soooo cool! Definitly a SoCal pelican. Your piggy's looked very comfy hanging out on the boom. You are tethered, right? Abby I believe you are blessed with many wonderful followers, it is heart warming for me and I am sure for you as well to read the blogs for example Sunny Miller's today when she included that wonderful scripture from Joshua and that wonderful poem yesterday from Grant, WOW. Gee many days I can get another daily devotional, wonderful humor, genuine knowledge and of course a dose of seeing people 'loving one another' by just reading you and your bloggers insightful comments. Thank you Abby for bringing all these magnificant people together and taking us all along with you. Please stay safe and continue to enjoy your wonderful adventure. I enjoy reading your blog. The pictures really add another dimension. It is like we are along for the ride. I am a tax accountant in Chicago and we are in the middle of our busy season. Your blog is a pleasant distraction-don't tell my boss. Godspeed. It looks very nice and comfortable out there. When the sea is calm it should be O.K. for me. Great pics again and Charlie looks so cool. Thank you. Sail on safe and enjoy it out there. We are excited to see you have a cool 'buddy' on board. Also, it was a reality check for the kids to see you have to do your own laundry. Imagine that! Keep your chin up Abby, many of the kids are going to follow your progress even after school gets out at the end of May. God bless. @Anonymous 5:37am: you wrote: "Why don't you take the reef out if the wind is only 5 knots??" And check out this video of the Hydroptere which holds the world speed record and has the main reefed. Just saw your post and it made me smile.f While I deal with the day to day obigations and hassles that we all do, you are a ray of sunshine and it is always a pleasant part of the day to read of your journey and to know you are well. Laundry done, pelican good, great picture of you relaxing with your feet up. I am so happy that things are going good for you. Interesting that you are reading the "Hobbit" as that came up in a conversation I was having about you the other day. Great book, but nothing compared to the adventure you are undertaking. I always think this about you...Brave girl, great boat, amazing heart and spirit...you are NEVER alone. We are thinking of you always. We watch you daily and wish you success. We send you big love and always, the spirit of Brazil. Keep on going Abby! Your story is so inspirational and I personally hope you don't get lonley out on the high seas there. :) My World History class is learning about Columbus and other explorers, and my teacher told us all about you! We are all eagerly following your blog and hope you safe! How fitting that you're reading The Hobbit. Maybe on another trip when you have more time you can come and explore this beautiful land of the Lord of the Rings. You must know that Auckland is called the city of sails. Praying for your safe travels. Your blog is beautiful. A visit to the Brazilian coast. Make this all into a book! Super Shots..I love those great shots of the sea..even the pinkie shot..I wondered whether your wind turbines were whirling and the camera stopped them or...uh..you know...The sea looks superb..the skies are incredibly blue..and all in all it looks like you have a perfect day going on there. See, if you keep going, you'll find out why LOTR did so well in films! I've had a very busy week so it was a surprise to have the time to check your blog and see you have been busy too - blogging. Glad you didn't lose your clothes in the squall - they can come out of nowhere! At least where you are you can hang your washing out and no one will get to see your "smalls"! Hey, I thought this was supposed to be an unassisted circumnavigation! What's with the crew on the winch??? A stowaway perhaps? Maybe s/he stole your hair brush. Re the hobbit, when my (ex)husband and I set sail many years ago, I took the Hobbit and the Lord of the Rings trilogy with me. They're among my most favourite of books. But I won't spoil the ending for you. Light boats have an advantage in light winds don't they? At least you keep moving, however slowly and erratically. Stay safe and dry, and hope the cold front appears just when and where you need it. Happy to help but not sure of your exact question. 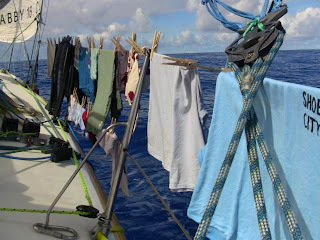 Most of your research is essentially correct- at its simplest "reefing" is reducing the amount of sail exposed to the wind. This is done for a number of reasons depending a whole bunch of factors. If you are "just cruising around" you might want to reef down a bit just to reduce the boat's heel so its more comfortable below (that way you walk on the cabin sole - the floor - instead of having to walk on the sides of bunks! If you are racing, or pushing the boat for best performance, you also don't want it dragging the leeward rail in the water. The strain on the rigging and the steering systems (tiller, rudder post and bearings, etc) also increases with speed, just as the strain on the rigging increases with the wind speed. ""There are reef points which divide the lower part of the sail into equal parts and when the wind comes up (and this is more when you are heading into the wind when your sails are taut called close hauled) you will "take out a reef"."" The middle of this statement isn't as strictly true as it's worded....you would consider reefing on many points of sail, not just close hauled. The last part is OPPOSITE of the reality. As the wind comes up, you would consider taking IN a reef NOT taking one out. The reef positions are commonly called "reef points"..first, second, third (sail size being reduced at each step) are common. If you over hear someone say, "The barometer dropped so fast we were down to the third reef in less than 40 minutes and then it really started to get ugly. "...you are about to hear an interesting story. 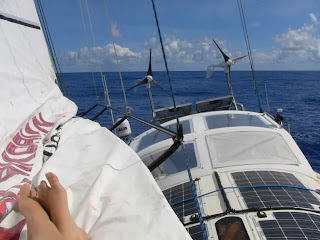 The blogger who asked about the reef on Abby's boat, noticed that Abby's "toes shot" was taken with her lying in the folds of the mail sail, as it lay reefed down on the boom. You wouldn't expect someone who was in hurry to get around the world to have put in that reef in only a 5kt breeze. They were sharper than I; I noticed that in previous photo the block on the deck through which the head'sl sheet runs was too far inboard and it was effecting the sail trim, but missed the ramifications of the "toe shot". Clearly we don't know why the main sail was reefed. Maybe it was done for the safety of the shot...Abby set up the bellied sail as a cozy location for the shot. Maybe she was planning to go below after the photo and tighten belts again and didn't want to get pitched into the engine if a gust of wind blew through. Pictures ALWAYS say more than words...!!! They make us be right there... close to you...!! Hello from one Abby to another :) I am fascinated by your journey and love reading your blog. Thank goodness for inmarsat, right? As a former Naval Officer and navigator, I couldn't imagine sailing around the world without a warship and a crew of 350, so I really am amazed at your bravery and dedication! In my Navy days, there was nothing better than being alone on the bridgewing in the middle of the ocean in the middle of the night with a million stars in the sky, the waves lapping up against the bow, contemplating our place in this world and thinking about my loved ones back home. It's a time of peace and tranquility that I'm unable to find anymore in my busy life and city lights, so I hope that you cherish those moments. Lose yourself in the stars and then let them guide you home. You have a lot of people thinking about you and praying for your safe journey. I look forward to reading more from you and following your travels. Hi Captain Abby, Looks like your relaxing and making yourself at home.Showing us how you really live on board is very refreshing. The wind will definitely pick up. Be Safe! Godspeed! Still on deck or doing some cooking? It is all about balance, keeping the sail full, going easy on 'Parker', gettting the most out of the wind with as little work for the sailor and as little strain on The sailboat as possible for a given course and sea state. No two sailors would make the same choices on the same sailboat and even less so on different types of sailboats. I have absolutely no doubt that Abby and Wild Eyes are perfectly tuned to one another and that Abby's choices are the right ones. Go Abby! Take care, Be safe. I am a fellow young lady in her teens who has been reading your blog for quite a while now, and am enjoying following your journey around the world. I was also very excited when recently I read about your brother Zac on the Harris brothers website *the Rebelution*. You two are a great example of teen's doing hard things! Keep it up. The Hobbit is such a wonderful book! When you get back you should start The Lord of The Rings, it is just as good(and exciting), if not better. Abby has a gyro stabilized satellite antenna that gets internet data and phone almost anywhere in the world at $12.00 per MB so she can be on the internet any time she likes it just adds up to a very large bill every month. it is the large dome in the picture. @Steve ... Thanks for the explanation. I hope others beside me learned something new, then my blundering would be worthwhile. I thought reefing in or out was synonymous, because of the word reef, meaning to lower the sail. Now I understand, with your explanation what Anonymous 5:37am was talking about. I thought he was the one who didn't know anything when it was me. Too funny. You can't beat first hand experience! I read The Hobbit (and the Lord of the Rings) when I was a teenager almost 4 decades ago. I loved them. You will get addicted to them! Enjoy. Sounds like you had a nice relaxing day. That's good. Kick back and read a book.Hope the winds pick up for you. Waiting to hear of your trip around the Horn. Well, it appears that you are having the time of your life! MUCH BETTER sail trim on your jib! Good an ya! Tell us about the stars at night. Just love your pictures Abby, especially your stuffed friend, are they designer glasses that he is wearing:)? 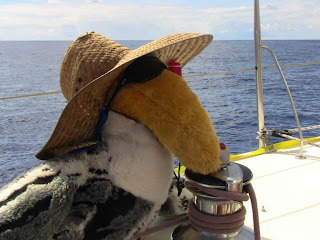 i love your pelican stuffed animal with it's hat! so adorable! if you like the hobbit enough to read more of those types of books, you might like artemis fowl or an earthly knight. a really great inspiring book is an autobiography called front of the class, about a teacher who has tourette's syndrome. do you have time to watch movies on your laptop? i'm sure you have youtube and itunes on there. books are a great way to escape because if you're by yourself it's easy to imagine that you're really there and aren't alone. love the updates!